Christina Katopodis is a doctoral candidate in English, a Futures Initiative Fellow, and a New Media Lab Fellow at The Graduate Center CUNY and an adjunct at Hunter College. Recipient of the Ralph Waldo Emerson Society Research Grant in 2016, and two consecutive GC Provost Digital Innovation Grants (2016-17, 2017-18), Katopodis began recording sounds at Walden Pond in 2016, and developing this website to bring those sounds to the general public. After working with recording artists, professional mixers, archivists, musicians, philosophers, and park rangers, Katopodis developed The Walden Soundscape podcast to make a digital podcast version of her dissertation chapter on Henry David Thoreau. Katopodis’s dissertation explores the influences of music, nonhuman sounds, and sonic vibrations on 19th-Century American thought and literature, examining three major Transcendentalist figures, Margaret Fuller, Henry David Thoreau, and Ralph Waldo Emerson, as well as Pragmatist William James. 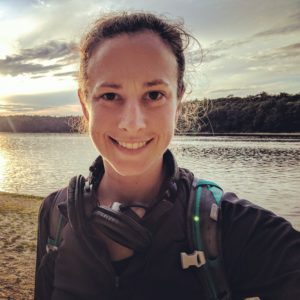 When she’s not writing or teaching at Hunter College, Katopodis spends much of her free time trekking the Appalachian Trail and has so far completed over 1,000 miles. Read about Katopodis’s pedagogy here.